The oddly warm weather continued today and I was in no mood to do anything constructive in the sweat-inducing humidity. So I basically wasted the entire day. In my defense it’s only natural to sit outside and sip a cold beverage on a day like this, but more so in August, not October. I think the plants agree. Most of these pictures were taken earlier in the week and it’s unsettling how quickly the dry soil, heat and cooler nights have things spiraling down into the little death of winter. 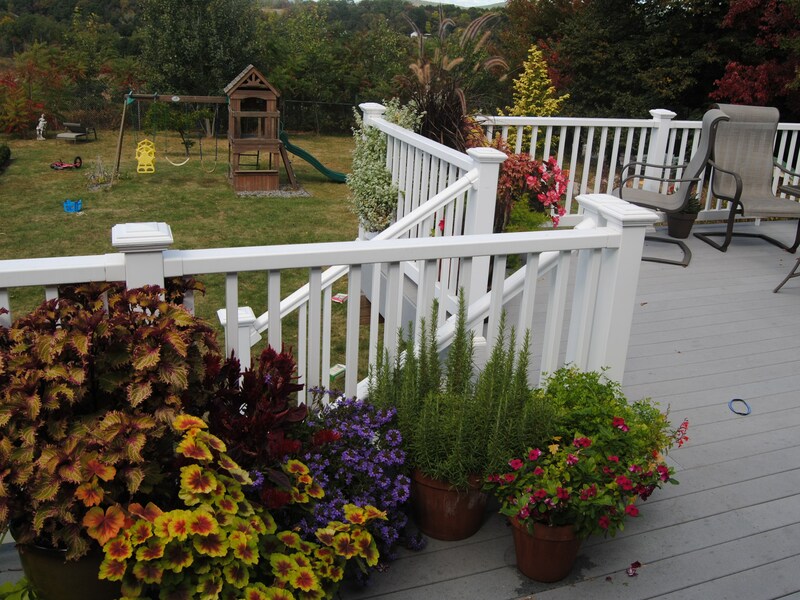 My warm weather friends on the deck such as the vinca and coleus look ok, but the cool nights are making them drop leaves and get all sad and brittle. The ones that seem just as happy as in July are the blue fanflower (scaveola), rosemary, and the chartreuse leaved geranium (pelargonium). Right now I’m imagining myself taking these into the garage to try and save something from frost. The geranium is actually a survivor from last year and to look at it now you’d never imagine how close to death it was in March. 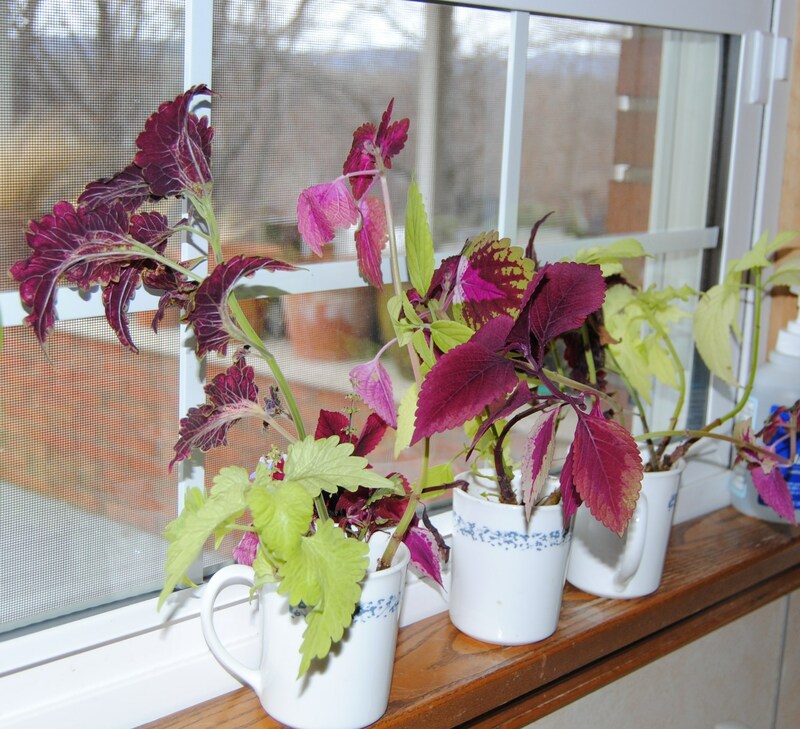 Overwintered coleus are another plant that somehow escapes death on a windowsill and then comes back just fine when the warm weather returns. I usually plant a couple in the front bulb bed, and by summer’s end whatever’s not filled with hosta is overtaken by coleus. Hopefully the dormant bulbs that sit underground are none the wiser. The ‘hot biscuits’ amaranthus which looms over the bed is probably not the best design move here, but I had a weakness for them this spring and their weedy looking stalks are scattered throughout the yard. Plus for some reason this year’s baby tree frogs are also strangely fond of this plant. I find more baby frogs on the amaranthus than anywhere else. 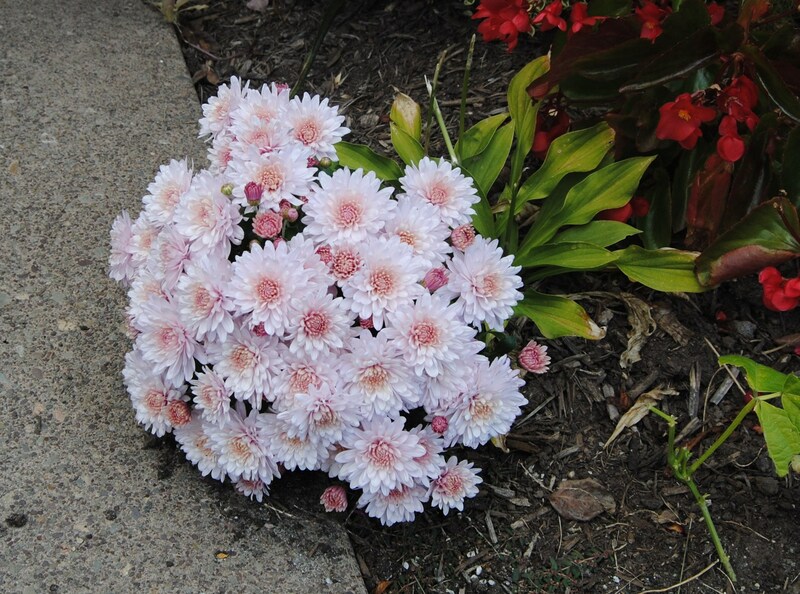 I got lucky and one of the chrysanthemums on the stoop last fall must have seeded out. This little dwarf couldn’t flower more if it tried, it looks more like someone dropped a bouquet while walking in instead of a poor commitment to weeding on my part. I’m really pleased right now with the annuals and tropicals in the front bed. The colors may not all go together but I just don’t get tired of looking at the mix of fresh flowers. Unfortunately the hydrangea flowers have gone brown due to lack of water in the couple days since I took this picture, but the coleus and profusion zinnias carry on. 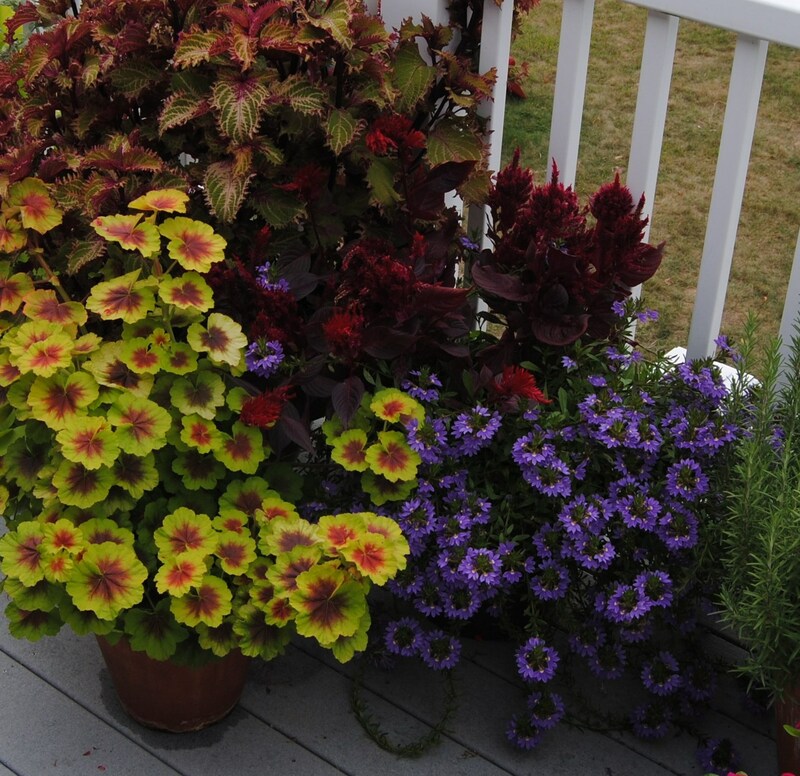 It’s hard to believe all these coleus owe their existence to a water filled mug on the windowsill. Since I’ve added a few new ones this year I’m afraid I’ll have to sneak in a fourth mug this winter. I only hope the boss doesn’t pick up on it, any houseplant that requires either dirt or water or risks bringing in bugs is in not on her preferred list. The zinnias are putting on a last stand against the shorter days. This lavender used to be my least favorite color but the hot pink I usually prefer didn’t germinate well this spring, so I’m left with these…. I don’t think either color would have had a chance of blending well with even more orange amaranthus. Most of the annuals will be lost when the first frost hits (probably in the next two weeks) but I’m having trouble letting go of my senna alata (candlestick bush) seedling. This is one of two that germinated, and I love the oversized grayish foliage! Unfortunately our growing season is just too short and I’m just too lazy to give it an earlier start. So now I have to choose between a sure death by frost and possible death by my hand. It’s so much easier to point the finger at winter. I read somewhere that if frozen they may sprout again from the roots. To me this means I may be able to get away with overwintering the root ball in the cold yet heated garage. It may not work, but if it means I may start next year with a much larger plant I’m game! So I think I know where this will end up going…. Am I the only one contemplating all the annuals I wish I could rescue from the inevitable? Wiser gardeners have probably learned the lesson years ago, but every fall I can’t help but try and save a little of the summer gone by. This entry was posted in annuals, fall, overwintering tropicals and tagged 'hot biscuit' amaranthus, Annual flowers, candlestick plant, cassia alata, coleus, growing annuals over bulbs, mixed flower border, overwintering coleus in water, overwintering geraniums, senna alata. Your front border has done well this year. I like that amaranthus. Our weather here has been very warm and dry too. I should take some coleus cuttings for the windowsill before it dies back. We’re supposed to get something Monday and some tropical storm leftovers will mix in. I think we’ll finally get a good soaking, but I feel like whenever we get these tropical leftovers it means the end of summer for sure. Finding space for the non-hardy plants is always tricky… the house is just too warm, the cellar too dark, the garage too cold…LOL! I take cuttings from geraniums as they fill one windowsill in an unheated room and don’t get too big until spring. That front bed really does look lovely – full of colour. This Amaranthus looks certainly very special and the colour is quite a challenge. I have a very similar Pelargonium but it didn’t do to well, too hot maybe. 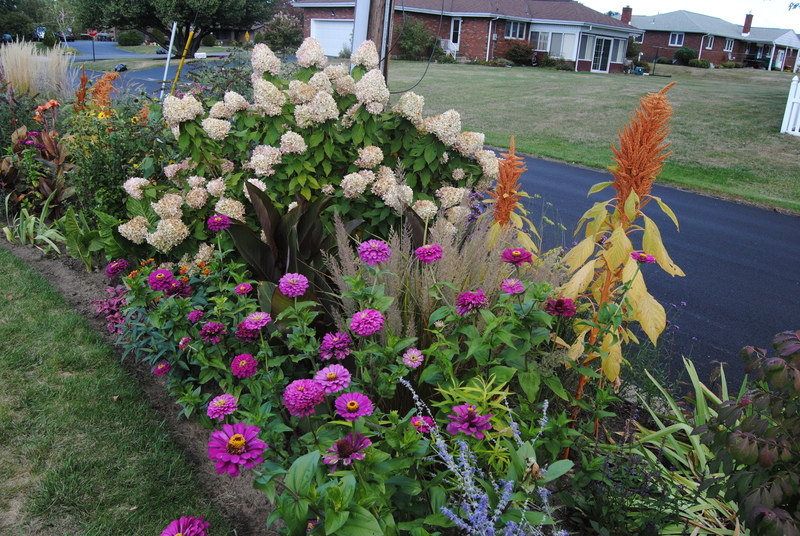 Your tropical border looks great, the Zinnias are a delight. Winters here aren’t too bad, and now that I have a greenhouse I shall throw everything in there if it gets really cold. I’ve been trying to find out where you garden? I’ve been lucky with the pelargonium this year, much better than last season. I have it on a drip irrigation system and it gets watered three times a day, you would think that’s much too much but it doesn’t seem to mind…. I think the terra cotta pot helps though. Still so much color in your garden! I’ve never seen geraniums with leaves like that, I thought they were coleus at first. I love Zinnias also but prefer orange and yellow. I’m starting to like geraniums more and more. My grandmother would be proud! Your garden looks good despite the heat. We have been having the same weather, far too warm for this time of year. I am looking forward to the frost. I don’t mind waiting the seasons out, but I think my plants beg to differ and would like a cool down. I don’t mind a late frost, an early frost sometimes makes me feel robbed when it’s followed by nice weather.